I took cipro for 11 out of a prescribed 14 days, but I had to stop because I could hardly function. I kept saying that all of my bones hurt. Then I read about the side effects, and it appears to be the tendons. So that must be what is hurting, but it is more than than that. I feel like I am dying. It's an all over general energy-draining feeling of malaise. I can hardly function, and it has been over 2 weeks since I went off of it. My muscles seem to be weakened in general. I would like to counter this naturally, if that is possible. The Tendons are not the only problem. Well, I do believe that you are right that it's not 'just' your tendons. For one thing, the Quinolones 'chelate' or absorb and excrete nutrients from your body and so a likely part of the problem is that you now have some severe nutrient deficiencies. You are also right on another count too, it's not 'just' your tendons that are the problem, it's a well known fact that cartilage, bone and muscle can also be damaged, however these are seen as SO rare that no one bothers to tell patients about them. Cipro is seen as being the SAFEST of these drugs and therefore that's another reason no one bothered to tell you. However, we know the truth. These side effects are NOT benign, these drugs are NOT safe and no matter how 'rare' these symptoms are, they affect tens of thousands of people who have had their lives destroyed due to these supposedly 'safe' drugs. The doctors who prescribe these drugs feel like these problems are so rare that the benefits are worth the risk- that is until they or someone in their family is affected and then they suddenly see the HUGE risk that these drugs pose- especially when they are given for minor infections such as sinus infections or urinary tract infections. In these types of cases, it should be CRIMINAL for doctors to prescribe them. 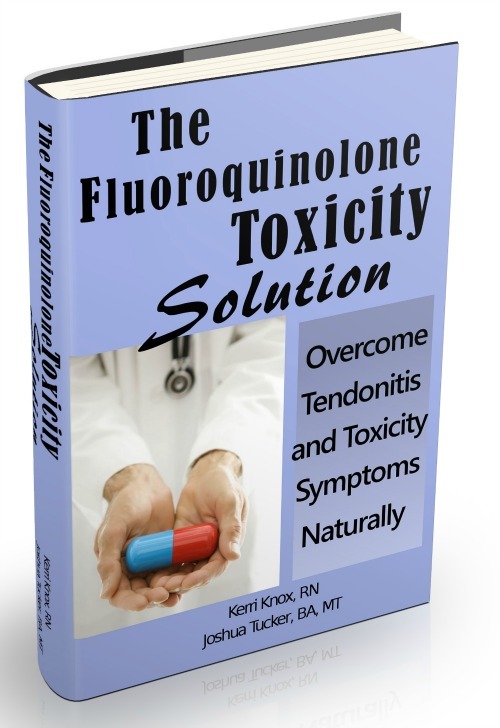 Fortunately, there is help and I HAVE seen people be helped with natural solutions, which is why after much work with real people in the real world with this problem I wrote The Levaquin Tendonitis Solution to help people like you who've been affected and for whom there are just simply no other solutions out there.